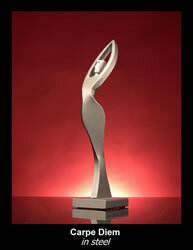 Several Boris Kramer sculptures are designed for award ceremonies. Achiever, Carpe Diem and Mentor are just three examples. They are available in various metals starting at 12" tall. GlassMaster Bob Kelly of Vitrix Hot Glass has supplied one of our Fortune 500 Customers with almost 500 HeecheeMini Sculptures & Mini Heechee Sculpture Arched (variety of colors) over a three year period. Corporate commissions of speciality sculptures can be created by Boris Kramer. Click Speciality Sculptures to see some examples. Sculpture in stainless steel & low carbon steel. We offer this work in 10, 12, 14 & 16 inch sizes. All sculptures have five layers of clear coat to protect the finish. Each sculpture varies slightly in shape as they are hand forged. Signed by the Sculptor, Boris Kramer. Sculpture in low carbon steel. We offer this work in 10, 12, 14 & 16 inch sizes. All sculptures have five layers of clear coat to protect the finish. Each sculpture varies slightly in shape as they are hand forged. Signed by the Sculptor, Boris Kramer. GlassMaster Thomas P. Kelley's creation of Heechee Mini Sculpture. 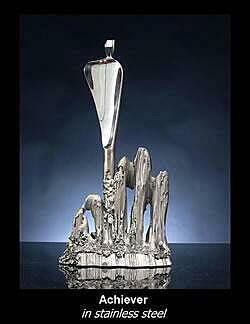 Done in hyacinth and clear glass, this is a modern-contemporary sculpture that is an attention grabber. It is truly dazzling. Heechee mini sculpture comes signed Vitrix and is dated. It is approximately 10.50"h x 6.5"w.
GlassMaster Thomas P. Kelley's creation of Heechee Rainbow Sculpture. This is a modern-contemporary sculpture that is dazzling. It is signed Vitrix and dated. It is approximately 9.75"h x 6.5"w.
GlassMaster Thomas P. Kelley's creation of Heechee Mini Sculpture. Done in ruby and clear glass, this is a modern-contemporary sculpture that is an attention grabber. It is truly dazzling. Heechee mini sculpture comes signed Vitrix and is dated. It is approximately 10.50" h x 6.5" w.
Exquisite Heechee Sculpture in blue tones and clear glass, signed and dated by Vitrix. Here is a sculpture that commands attention and will attract the eyes of every viewer. Approximately 16.0" long x 8.5" high and 7.5 lbs, a significant art glass sculpture. Available in large size. Vitrix Hot Glass & GlassMaster Thomas P. Kelley's creation of Heechee Sculpture Small in Confetti. It is approximately 16.0 long x 8.5" high and 7.5 lbs. Available in large size. It comes signed and dated. Perfect for home and office. Seen in many law offices and corporate board rooms. Exquisite Heechee Sculpture in ruby and clear glass, signed and dated by Vitrix. Here is a sculpture that commands attention and will attract the eyes of every viewer. It is a popular and significant art glass sculpture that can be found in the collections of glass lovers world wide. Approximately 16.75" l x 10.0"w x 9.5" h and 10.0 lbs. Available in lge. size 21 x 12 x 12" deep. Kramer Sculptures, in low carbon steel, copper and bronze. We offer the 10, 12, 14 & 16 inch sizes. All sculptures have five layers of clear coat to protect the finish. Each sculpture varies slightly in shape as they are hand forged. GlassMaster Thomas P Kelley, Vitrix, magnificant glass sculpture, Mini Heechee Arched in Ruby fade. Five wraps of molten glass offered with a black center. Clear center available. Approximately 12.0" l x 7.5" w. Artist signed and dated. Vitrix Hot Glass and GlassMaster Thomas P. Kelley present Pyroplasm Sculpture in black/hyacinth. This creation is artist signed and dated and approximately 18.0" h. Available in several colors. A corporate favorite and an exquisite and dramatic focal point in any home decor. Vitrix Hot Glass & GlassMaster Thomas P. Kelley present Pyroplasm Sculpture. Shown in blue, artist signed and dated, approximately 21.0" x 10.0" x 10.0" & 7.0 lbs. Available in a variety of colors. Nicholson Blown Glass, artists Rick and Janet Nicholson, Tripod Study Award. Shown in the Landscape Series withe the colors steel, wheat and aubergine. Size: Platter approx. 8"h x 10"w. 16"h with stand. Nicholson Blown Glass, artists Rick and Janet Nicholson, Uplift Study Award. Shown in the Wave Series withe the colors bone, cherry and dark topaz. Size: Platter approx. 8"h x 10"w. 15"h with stand.